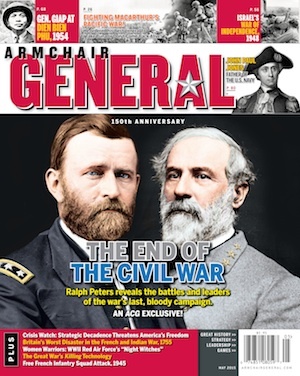 Civil War II – PC Game AAR | Armchair General Magazine - We Put YOU in Command! Armchair General received this After-Action Report strategic Civil War II game coming soon from AGEOD. Watch ACG for a preview of this sprawling game of America’s greatest historic challenge. I am happy to report that Civil War 2 (CW2) is a welcome addition to the formidable AGEOD lineup. It brings a game engine much improved after six years of development and it should appeal to both AGEOD’s American Civil War (AACW) veterans as well as rookies to the AGEOD game experience. CW 2 features a larger map, more units with a higher historical fidelity, a refined economic engine, and a tactical battle subroutine that enhances the role of the better generals in the conflict. Further, the game’s movement and production interfaces have been improved from the original. One of the benefits of the AGEOD game engine is that human players, if playing head-to-head, or human vs. computer, plan their turns in 15-day increments and then see them executed simultaneously with their opponent’s. This system avoids the pitfalls of a simple turn-based game where, a human opponent most often, surrounds enemy units and destroys them before the opponent can react. Simultaneous execution, especially for this period of warfare, simulates the way armies fought, receiving general guidance from higher HQ, then attempting to execute that guidance as the situation unfolds. Thus, it isn’t uncommon to see an army ordered to do one thing, end up doing nothing, or, occasionally, marching in the opposite direction. Regarding some of the new units, Confederate cotton clads are introduced. This class of warship, a poor-man’s ironclad, were used by Confederate Gen. John B. Magruder to retake Galveston Island, Texas in January 1863. (See:http://www.riverboatdaves.com/aboutboats/uncle_ben.html) Another welcome addition to the unit roster is the half-supply unit. Supply units are costly, especially for the Confederates, and the half-supply wagon is especially useful for sustaining military operations in Missouri and the Far West. As further refinements are made to the beta version of CW2, I expect that the game will come to outshine AGEOD’s American Civil War, a timeless classic. As a result, Civil War 2 should appeal to gaming veterans, military historians, and newcomers to the pastime. Playing as the Confederates in the April, 1861 campaign game. The options are: fog of war, on; medium delayed commitment; normal foreign entry; historical attrition for both sides; non-automated replacements; battle planner on; activation rule in the middle setting; non-randomized generals; standard rule for naval boxes; historical allowance for recruitable units; easy supply off; AI on Lieutenant; all behaviors; normal activation bonus; medium detect bonus; normal aggressiveness; and more time for AI. After the first 13 months of fighting, the war is hewing fairly close to history, with the Confederates doing better than historically, but the Union avoiding any real large defeats. The Confederates have invested heavily in industrializing, ordering replacements for the heavy coastal artillery guarding their key ports, and ordered few more naval vessels than was the case historically. Numerous demonstrations have wracked the North forcing President Lincoln to crack down on civil liberties. Confederate morale is 117 with 1,102 victory points accumulated, gaining 49 per turn. The Confederates have lost 19,575 casualties. They hold 11,500 Union POWs. The foreign entry level is 62, though the Confederates have done nothing specific to push this along, preferring instead to sell as much cotton as possible to Europe. Union morale stands at 52 with 931 victory points, gaining 53 per turn. Combat power is 122. 43,445 men are listed as killed, wounded or missing. The Confederate resources balance after builds and replacements is: cash balance 3, 627 conscripts, and 443 war supply, with inflation holding flat at zero percent! (By this point in the war historically, the Confederacy had already experienced about 300% inflation.) 126 rail points, and 50 river points. The Confederates did one partial mobilization, but have yet to pay for any volunteers. The Union ejected the Confederacy from what would become West Virginia, with a Confederate division maintaining a toehold at Lewisburg. Maintaining an adequate supply line was a problem for the Confederates, as the Union cut in behind the Confederate forces at Lewisburg, West Virginia, forcing a general retreat in harsh weather. In the East, there is no sign of a Peninsula Campaign taking shape as of early May, 1862. The Confederates have fortified Richmond, Norfolk, and Manchester and should soon have enough material assembled to begin fortifying Petersburg as well. General McClellan is at the head of the Northeastern Virginia Army with a combat power of 407 in Buckingham, Virginia, just to the west of Fort Richmond where General P.G.T. Beauregard awaits with the Army of the Potomac with 1,257 combat power. Any danger to the Rebel capital is greatly diminished by the presence of General Robert E. Lee at the head of the Army of Northern Virginia, poised to crush Gen. McClellan at the head of a formation with 2,090 combat power. The Union’s main Army of the Potomac, headed by Gen. Irvin McDowell, lurks up in Stafford, Virginia with an estimated 3,000 combat power. Confederate Gen. E. Johnson leads a corps of Lee’s army and has taken up a blocking position at Fredericksburg, Virginia. Gen. “Stonewall” Jackson, leading a second corps detached from Lee’s army, has just reconquered the Shenandoah Valley and, in a short surprise engagement against a slightly larger force, drove off the Union corps guarding Harpers Ferry. The situation in the Eastern Theater at the start of the 1862 campaign season—the Union presses down on the Rebel capital city while Lee attempts to relieve the pressure. In the West, the Union violated Kentucky’s neutrality and moved to take Lexington. But, the Confederates under General Albert S. Johnston at the head of the Army of Tennessee marched north during the winter. Pausing at Bowling Green to gather forces, then repairing the rail line to ensure a good supply line. Johnston took Louisville after about 45 days of fighting and siege and, in late April, made a quick march east to take Lexington against an outmanned General Sherman. Preparatory to this maneuver, Johnston unleashes General Nathan Bedford Forrest, using the “partisans ambush” regional decision to weaken nearby Union forces. The Army of Tennessee is at 977 combat power. To the south of it is Sherman’s recovering division at an estimated 102 combat power as well as a mustering force of Unionist Kentuckians at Pulaski with a strength of 468. Forts Henry and Donelson remain in Confederate hands. Meanwhile, General Grant sits up in Madisonville, Kentucky at the head of the 21st Division at an estimated 416 combat power. Grant could move down and take Forts Henry and Donelson, but would likely be vulnerable to a strong counter attack from the Army of Tennessee. On the Mississippi, the Confederates have fortified both New Orleans and Memphis. There are production orders in for enough material to fortify Vicksburg in a couple of months. The Confederates are determined not to repeat the historic mistake of not fortifying New Orleans, the largest city in the Confederacy that was taken by a seaborne attack on May 1, 1862, a loss that would greatly diminish the chances of foreign recognition of the new nation. In Missouri, the Union has done better than historically, keeping the restive state mainly free from Confederate forces. But, the Army of the West has built up under General Joseph E. Johnston, who was transferred out west from his post at the head of the Army of the Shenandoah. After a tough winter being low on supplies and losing some men to starvation while reducing the Union threat to his west in Indian Territory, Johnston is now ready to move at the head of an army with 769 combat power – once he reduces the Union garrison at Ft. Pleasant with an estimated combat power of 274. In Texas, General Sibley sits on the Red River in Sherman at the head of a highly mobile force of Texas Rangers and cavalry with the 2nd Texas Artillery, 6 pounder, as his only heavy punch. Sibley tried once to route the Union forces just to the north in Indian Territory, but, after initial success, had to retreat south due to lack of supplies. In the far West, General Baylor enjoyed brief success, pushing as far as Tucson, Arizona, linking up with the pro-Confederate militia there. But, as Union forces closed in from the north and the west, Baylor had to retreat back to El Paso, leaving the friendly militia in Tucson. The Union holds Western New Mexico, Ft. Cummings, Mesilla, Ft. Quitman, and all points north. The Texan dreams of an empire stretching to the Pacific are looking pretty dim. As expected, the Union Army of the Potomac, headed by Gen. Irvin McDowell, marched south. The result was an early version of the Battle of Fredericksburg with McDowell assaulting Gen. E. Johnson corps at Fredericksburg, Virginia for two turns. Even though attacking at almost three to one odds, the Union is repulsed bloodily twice, losing about 4,500 men in both early and late May. After the first attack, Lee, sensing an opportunity, swept north, leaving McClellan to lay siege to the much larger Confederate force at Ft. Richmond (something the hyper-cautious McClellan would have never tried). On the 13th day of late May, 1862, Lee’s army smashed into McDowell’s weakened army. A pitched battle ensued but a stalemate resulted, seeing about 4,000 men fall on both sides, but McDowell retreating north to Stafford. Meanwhile, Gen. “Stonewall” Jackson burst out of the Shenandoah Valley after plundering Harper’s Ferry and destroying the depot and rail lines there, captured Leesburg, then destroyed the reinforced garrison at Alexandria, driving off Gen. Franklin and capturing a 12-pounder unit. In the west, the Union’s General Thomas moved south to capture Nashville, arriving at the gates of the key city by the end of the first turn in May. General Albert S. Johnston’s Army of Tennessee, anticipating this move, marched back into Louisville from Lexington, then entrained in the second turn with plans to attack the bluecoats at Nashville. Thomas’ assault on Nashville came within a hair of succeeding. General Alexander P. Stewart had three militia, a 20-pound Parrott unit and a partially built 20-pound Parrott unit under his command. The Union destroyed all three militia units, but then culminated before taking the city. Thomas retreated north across the Cumberland before General Albert S. Johnston could engage him. In Pleasant, Indian Territory, General Joseph E. Johnston reduced the stockade there and, in two indecisive battles, has driven General John C. Fremont north. More maneuver in the East and in Kentucky, but no major battles. Johnston’s Army of Tennessee relieved Nashville, then entrained and raced back to Louisville, just in time to save the city from being invested by Gen. A. Howe’s troops. Compared to historical troop levels, General Robert E. Lee’s Army of Northern Virginia has about 32,000 men, including in the supply trains. There are an additional 17,000 men in two supporting corps for a total of 49,000. General P.G.T. Beauregard’s Army of the Potomac in the vicinity of Ft. Richmond has about 14,000 men under arms. In addition, about 1,000 militia remain in Ft. Richmond proper. By comparison, Lee had about 72,000 men at his command during the Battle of Fredericksburg from December 11-15, 1862. Given what has likely been a greater effort at industrialization at the expense of early mobilization, the strength levels in the East don’t appear too low. In the West, the Battle of Shiloh involved 44,699 men in the Army of Mississippi from April 6-7, 1862. The Army of Tennessee in the game has 20,000 men with another 8,000 men under Polk at Memphis and 5,000 men under Cleburne across the Mississippi at Hopefield, Arkansas. Again, a lower level of mobilization than was historically the case, but, likely due to significant efforts to industrialize while deferring mobilization and pursuing a defensive strategy in the interim—though the Army of Tennessee did manage to nab Louisville, so, perhaps the Union is also building up at the expense of army strength. The Confederates began to take the war to the North in late July. The Army of Tennessee crossed the Ohio at Madison, Indiana in pursuit of Gen. A. Howe’s forces. The Confederates took Madison as Howe evacuated ahead of the invading Rebels. General Albert S. Johnston caught up with Howe and, in the Battle of Columbus, destroyed Howe’s formation, inflicting almost 5,000 casualties at the cost of less than 250 while capturing Columbus, Indiana on the second day of battle. The battle netted 5 morale points for the Confederates. In Missouri, the first major action of the conflict took place as the siege of Springfield resulted in the surrender of two Union units, netting the Confederates 25 victory points and 1 morale point. At the beginning of the early August, 1862 turn, Union morale stands at 52 with 78,630 casualties compared to the Confederates’ 127 morale with 38,880 casualties and 29,800 Union POWs. General Joseph E. Johnston, having invested Springfield, sees the opportunity to race east to what appears to be a lightly-defended St. Louis. It’s good marching weather, and the Army of the West makes it to St. Louis in 14 days, metes out 2,200 casualties at the cost of only 676, captures a gunboat as well as the city’s defensive batteries. In a mere two months, the Confederates go from having no presence in Missouri to capturing half of a state represented as one of 13 stars on the national “Stars and Bars” flag. Seeing a similar opportunity to deliver a strategic blow to Union war efforts, General Albert S. Johnston marched east from Columbus, Indiana to Cincinnati, Ohio, estimating that he would have a 5 to 3 force advantage. The armies met after nine days of marching with the Army of Tennessee finding itself evenly matched against Don Carlos Buell with 21,000 men under arms. A pitched battle resulted in a Confederate loss, but not before inflicting 4,007 casualties as against 3,567 using a crossfire battle formation. Johnston remains at Cincinnati and may try to lay siege to the major city. Further south, General Grant has assembled a large division and has attacked the modest garrison at Nashville under Gen. A.P. Stewart. Grant’s attack was inconclusive and, complicating things, Gen. Patrick Cleburne entrained his division, crossed the Mississippi and detrained at Forts Henry and Donelson to Grant’s back. Grant will have to retreat to or risk getting attacked from the rear. Union forces in the East appear off balance, trying to counter Lee’s constant demonstrations. Lee gathers up his two corps, sitting idle for months guarding the approach to Richmond, and smashes into Alexandria with almost 50,000 men. The attack begins raggedly, however, when one corps hits 22,000 men under McDowell prematurely, resulting in the mauling of Magruder’s 1st Division under Gen. Edward Johnson’s corps. The result is a costly victory for Lee: he takes Alexandria, but loses 9,163 men to Union loses of 4,366. In spite of losing double what the Yankees did, the net result is no change in national morale as the heavy losses are offset by remaining in possession of the battlefield and capturing Alexandria. In Ohio, the Army of Tennessee’s second attempt to lay siege to Cincinnati is repulsed. The Confederates lose on national morale point. Grant, with his supply lines threatened, destroys the rails around Nashville and withdraws unseen. Confederate partisans, in the meantime, have been laying waste to Ohio and Indiana, destroying rails and pillaging the countryside. The Confederates have gone from victory to victory and are in possession of Virginia, except for the Shenandoah Valley, and are in a position to threaten Washington, D.C., though the Union evacuated the capital to New York City in 1861. Louisville, Kentucky still belongs to the Rebels and a strong Confederate army, remains just to the west of Cincinnati, Ohio. Union forces continue to make tentative marches down the Mississippi and towards Nashville, but have captured nothing of significance. Missouri is now largely in Confederate hands, including the key city of St. Louis. The Union is slowly rolling up the barren wastes of the far west, and may soon capture El Paso, Texas, in an ahistorical campaign whose progress the Confederates are monitoring. In reality, west Texas, denuded troops and male heads of households, would see the western frontier beaten back 150 miles by war’s end, not due directly to Union action, but rather to Indian war parties having no opposition. Confederate merchant raiders sunk 62 in money and 10 in war supply in late August, while Confederate blockade runners brought in 10 money and 2 war supply in the Atlantic and 13 money and 3 war supply in the Gulf. The Union blockade ratings are 55 in each theater. The Union holds no coastal Confederate ports and, so far as can be seen, has not tried to blockade any specific port. Confederate morale is 122 up 5 from early May, with 1,399 victory points, up from 1,102 in May, gaining 50 per turn. The Confederates have suffered 56,760 casualties, more than triple May’s figure. The foreign entry level is up to 71 from 62 in May, though France declined to give recognition. This is tempting the Confederacy to try something rash, such as enact a cotton embargo—but, the war is going well enough now, that Richmond is likely to delay the decision. Union morale stands at 62, an increase of 10 since the campaign season began in earnest in May with 1,174 victory points, gaining 53 per turn, the same rate of increase in May. 92,340 men have fallen in battle, more than double May’s casualty count after only four months of fighting and 29,800 remain unexpected guests of the Confederacy. Union combat power is fixed at 106, down from 122 in May. As for the economy, money remains tight, while war supply and men are plentiful. General Albert S. Johnston and his Army of Tennessee, moving south after the failed attempt to take Cincinnati, finds Grant’s division, exhausted from his failed attempt to take Nashville. Johnston annihilates Grant, who was low on supply in the vicinity of Munfordville, Kentucky. A small Union force has begun moving north from the Florida panhandle and is about 6 weeks away from threatening some of the newly-build industry in Georgia. But, the Confederate Department of War has decided the threat can be contained with local militia for now. In the East, Lee, dreaming of a knockout blow, crosses the Potomac and battles outside of Washington, D.C. The battles, to last more than a month, result in more than 18,000 Confederate casualties. But, Washington, while no longer the U.S. capital, remains unfortified, so Lee will keep trying. Lee also calls up Beauregard’s army from its Richmond garrison duties, leaving the Confederate capital lightly protected. The Army of the Potomac is rendered combat ineffective after two pitched battles. Lee sends it back across the Potomac to rest, refit and guard his escape. After ejecting most of the Union forces from Virginia, Lee orders his army to converge on Washington, D.C., even though the Union capital was evacuated to New York City in 1861. Lee even brings up the Army of the Potomac from Richmond to cover his logistics base in Alexandria. With the former Union capital unfortified, Lee opens the Battle of Washington with a bloody assault on the entrenched Union lines. His attempt to envelop the Union lines is thwarted. The Army of Northern Virginia suffers 20 percent casualties but the battle is rated a draw, so national morale is unchanged. The Battle of Washington continues 7 days later, when Lee, deciding to take the Union garrison in a bold frontal attack, is again repulsed, this time decisively, losing another 20 percent of the Army of Northern Virginia in a vain attempt to take Washington by storm that cost the Confederates 5 morale points, a terrible blow. The Second Battle of Washington: P.G.T. Beauregard’s Army of Potomac is brought up from garrison duty in Richmond to support Lee’s Army of Northern Virginia and is badly mauled. The Confederates lose 2 morale points. Will they be able to continue the bloody assaults on Washington? The final battle for Washington—Lee’s army is running low on ammo, but the Union garrison, running low on elan, sees 31 units routed, even though they enjoy a 127 percent trench advantage. Washington, D.C. is taken by a Confederate army using the battering attrition techniques that Grant was to make his hallmark 2 years later in the actual conflict. In early fall, after 45 days of battles in and around, Washington, D.C., the Confederate armies under Lee take Washington, then follow up their victory by pursuing the fleeing remnants of the Union force, defeating them at Port Tobacco and taking that village too. Given the residual importance attached to Washington, D.C. even after the capital is evacuated to New York City, Athena (the game’s AI engine) would have been expected to fortify Washington. Had she, the attack on Washington would have likely seen catastrophic casualties, breaking the back of Lee’s army. Foreign entry stands at 89 out of 100, signaling a high likelihood of European intervention on behalf of the Confederacy. The Union sues for peace in late October, 1862, just before the mid-term elections. There are still some items that need to be improved, however, as is expected in beta. Economics needs further refinement, for instance, better player understand on the payback for building up industry vs. spending money to mobilize early. In AGEOD’s American Civil War (AACW) when playing as the Confederates, deferring mobilization while building up industry was my preferred strategy, aiming to defeat the Union by 1863 or 1864. Further, AACW modeled the impact of inflation more than CW2, though even AACW would only manifest a small fraction of the ruinous inflation seen in the South during the conflict. Further, AACW made it clear that adequate rail points were needed to spread supply around, this is not as clear in CW2. Lastly, when industrial cities are captured in CW2, there should be a cooling off period before the facilities begin producing for the owning side – perhaps 2 turns for every turn held by the enemy up to 6 turns (three months) to simulate the disruption caused by an invading army, even if the facilities aren’t specifically plundered or destroyed through scorched earth. AGEOD’s Civil War 2 game engine is superb. This sophisticated engine is the backbone of the game. I expect to see Civil War 2 improved to the point of excellence upon formal release and, given AGEOD’s record, undergo several additional patch improvements for years after release. Civil War 2 is a game that players will easily spend scores of hours with and, unlike many other contemporary games, end up learning a significant amount about the most important war in North America. Civil War 2’s AI, called Athena, works with the construct of AGEOD’s detailed game engine. Athena is a wily foe. It takes into account supply levels, force ratios, strategic cities, and, importantly, appears to have a random grand strategy rule that allows a computer opponent to mix it up, providing a solo player with countless variations to deal with. For instance, Athena appears to be changing up her strategy on violating Kentucky’s neutrality, which is excellent, as it prevents a human opponent from anticipating that action—which, given the huge east/west frontage that a front through Kentucky opens up, is a very important strategic consideration, especially for the South, with its limited resources. Game balance can also be modified in several ways by players seeking to define their computer opponent. Athena can be given more or less men and materiel, more or less aggression, randomized or historical leader attributes, more time to think, better reaction die rolls, better intelligence or not (fog of war setting) and historic attrition rates or not. All of this attributes can be traded off, one against another, allowing for a myriad of settings, each subtly or not so subtly changing the game experience. Athena can use a few improvements, such as not so readily abandoning Washington, D.C. as the capital and doing a better job at not pushing unprotected supply and artillery units into dangerous areas—these are too readily captured by the enemy. Also, Athena’s early game aggressiveness needs to be toned down—it just doesn’t do to see Johnston’s Shenandoah army corps in Philadelphia in July, 1861. That said, AGEOD’s developers have proven to be resourceful and keen to accept suggestions from the beta testers (and, for AGEOD’s American Civil War, the predecessor title, where there were some 20 patch upgrades over several years). For instance, in response to beta testers’ suggestions a subsequent beta build days later added basic fortifications at Washington, Alexandria and Richmond after a few turns which should go a long way towards preventing ahistorical early victories by either side due to a swift capture of the enemy’s capital city. Chuck DeVore was commissioned an officer in the U.S. Army in 1985. He was in the active reserves through 2007. He served as a staff officer for tactical combat formations ranging from battalion to corps. He was also a company commander. From 1986 to 1988, Chuck was a civilian White House appointee in the Pentagon where he was able to participate in classified war games. He served for six years as an elected official in the California State Assembly where he represented almost 500,000 people. He co-authored “China Attacks,” a technothriller novel about a Chinese surprise attack on Taiwan and is serializing a second novel, “Twilight of the Rising Sun,” about a future Sino-Japanese conflict.